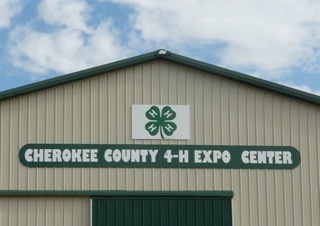 The Cherokee County 4-­‐H Expo Center facility is located on the Cherokee County Fairgrounds and is easily accessible from US Highway 59. From the intersection of Highway 59 and Linden Street on the south end of Cherokee (North Star Community Credit Union corner), proceed north on Highway 59 and turn right on the first street, Hickory Street (A). The fairgrounds entrance is approximately ½ block east. As you enter the fairgrounds, immediately turn left (north) and follow the road to the Expo Center (B). A graveled parking area is located on the west side of the facility. Memberships are available for purchase to utilize the Indoor arena for open riding. The annual membership fee is $100 per individual or family (household) and is good through December 31. The arena is available 24/7 for member use unless the facility is rented for another event. Gift certificates are available for purchase and make a wonderful birthday, anniversary, or special occasion gift for anyone who loves to ride. 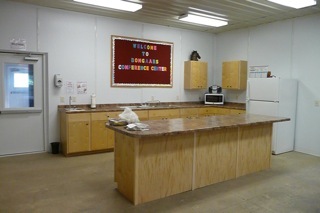 The indoor arena and/or Bomgaars Conference Center can be rented for a variety of special events such as auction sales, livestock shows and clinics, flea markets, machinery and car shows, public meetings, workshops, holiday parties, reunions, showers, and more. Camping spaces (with electricity or primitive) are available for a daily fee and must be reserved in advance. 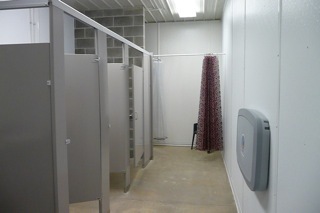 Other buildings on the fairgrounds may also be rented at rates determined by the Fair Board.